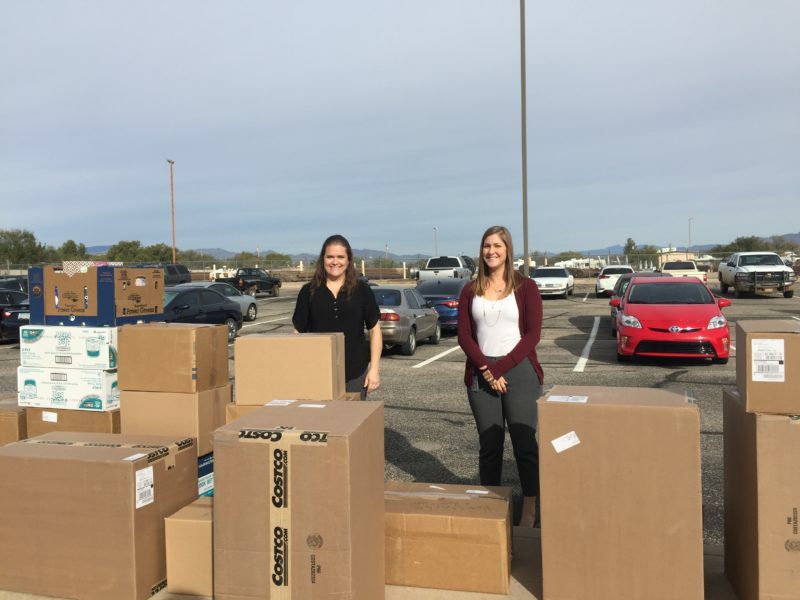 (BENSON) The call for donations of food, clothing and a variety of other supplies has become part of the holiday tradition at Arizona Generation and Transmission Cooperatives (AzGT), and each year employees show their concern for the communities they serve. This year was no exception. Both the Benson Area Food Bank and Catholic Community Services expressed their gratitude for AzGT employees’ generosity. Reilly said that the $500 in money and 200 pounds of food that came from AzGT employees last month helped to ensure that the people who depend on food boxes had them for the holidays. She said that about 14,000 people signed into the Benson Area Food Bank in 2018, which is more than 1,000 people per month. Some people who sign in are taking food for multiple people; therefore, the number of those served over last year could be much higher than how many signed the list. The sacks that Wilson mentioned were filled with items that range from toilet paper to socks and are given to homebound, low-income seniors in Cochise County. Kathleen Ortega, who coordinated the drive for many years and recently retired from AzGT as internal auditor and chief risk officer, said that it was enough to ensure that each of the 75 individuals served by the program received at least one if not more of the items that were requested. A remaining $330 of cash donations will help with “non-nutritional” items that range from electric blankets to home repairs. Both organizations have needs that extend beyond the holiday season. Donations are welcome at any time of the year.